The Toshiba Satellite L870-11J works well as a desktop replacement, thanks to its large 17-inch screen and decent processing power. But there are occasional issues with the build quality and design that need pointing out. Because this is a 17-inch machine, portability immediately becomes an issue. The Satellite L870-11J weighs a beefy 2.6kg and the dimensions stand at 409 x 267 x 31mm, meaning it's unlikely to be the first device you reach for before you head out on a road trip. Where the Toshiba excels is at performance on the big screen. The 17.3-inch Super TFT display is very bright and the glossy coating makes this an excellent laptop for watching movies or editing pictures. The Toshiba sports 6GB of RAM, helping to keep the operating system swift and responsive. Under the hood is an Intel Core i5-2450M clocked at 2.5GHz. This is a second-generation Sandy Bridge processor and, while capable, it is likely to be superseded over the next few months by Intel's third generation Ivy Bridge machines. Because of this, we can't give the Toshiba any points for future-proofing. There's no dedicated graphics chip inside the Toshiba Satellite L870-11J, meaning that high-end gaming is beyond the scope of this particular machine. Usability on the Toshiba is also a mixed bag. We were impressed with the large touchpad - the textured surface is different from the smooth palm rest and makes it easy and comfortable to use. Unfortunately, the keyboard doesn't fair quite as well. The isolation-style keys are well-spaced, but the amount of travel is surprisingly small. Also, we couldn't help but notice the severe flex on the keyboard that occurred during typing. 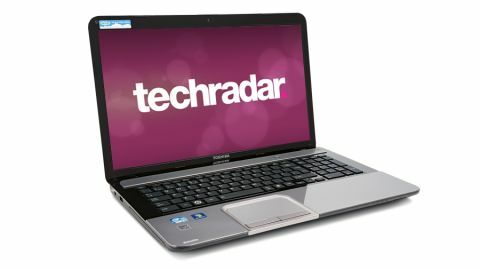 There are the usual ports and connections to take advantage of - something we would expect from a 17-inch laptop although Toshiba has only furnished the Satellite L870-11J with three USB ports. Elsewhere you've got HDMI, VGA and Ethernet connections and the standard 3.5mm headphone and microphone jacks. The battery life also gave us cause for concern. After running the Battery Eater benchmark program over a looped HD video, we only recorded 105 minutes before this laptop gave up and died. It's hard to recommend the Satellite L870 unless you're specifically looking for an affordable 17-inch machine with a good screen. It underperforms when it comes to usability and the introduction of Ivy Bridge processors and Windows 8 later this year further serve to relegate it. As a desktop replacement this will suffice. The asking price is another reason to give it a look over. But, there are better choices when it comes to 17-inch laptops.